This has nothing to do with search or usability, but it is the best description of the problems we have in Wall Street I have seen yet. I just had an experience with a feedback form that failed. I'd like to give you some background, discuss the failure, it's impact on me and challenge you to look at your own user experience and how you may be doing the same thing to your users. I have AT&T as both my telephone and high speed broadband provider. They have a new product called Advanced TV that I am interested in. I'm currently a DirecTV / TIVO customer and am enthusiastic about both products. Advanced TV has some features that are interesting to me - they might even be enough to get me to leave my DirecTV / TIVO. So when I received an email that offered a chance to see Advanced TV in action, I was interested. I clicked on the link, only to find that the nearest store was a 100 mile round trip for me. I am interested, but not $20 in gas interested. 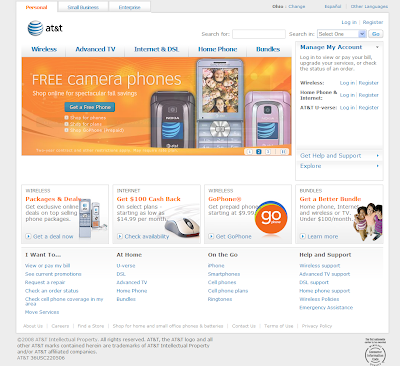 I determined to tell AT&T about this failure in marketing on their part. It seems like a simple enough thing to target their email - they know my address, they know the location of the store - how hard could it be to cross reference the two and eliminate me from the mailing? 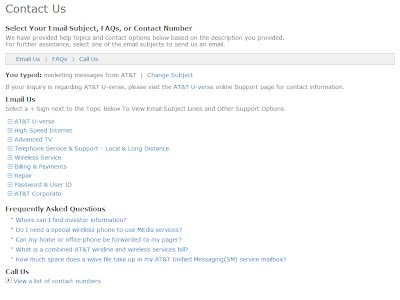 So, I went to the AT&T site to send them a quick feedback note. I had to do this as the email they sent did not have a reply address. First, can you spot the contact us link on this page? It is in light grey text, on a white background, at the very bottom of the page. It is hard to spot. This may be intentional, as they have several very clear help sections on the page. This may be an attempt to drive traffic to the help pages, rather than the generic contact us area. Once I found the contact us / feedback form, I opened the page to find what looks to be a nice easy form to fill in, set up as a wizard, starting with your subject line. Entering a subject, does not start a wizard. It instead sends you to a list of pre-selected subjects. This is where I started to become frustrated. None of these pre-selected subjects is related to my email. I tried several different terms and subject lines, I opened all of the suggested subjects. Not one related to marketing, nor was there a "I have a different subject" for the email. In the end, I randomly selected a topic and gave them my feedback. It likely will not reach anyone interested in my feedback, and the marketing department will be wondering why their promotion is not working. They sent it to people who said they were interested in Advanced TV. Why is the conversion rate so low? And the result of all this work on their part? I now regret having AT&T for my phone company and my Internet provider. I am concerned that I will not be able to find help when I have trouble with my service. I am no longer sure the features of Advanced TV are worth the trouble of changing television providers. Do I want to trade DirecTVs award winning customer service for this? Overall, an attempt to sell me on something I was interested in has left me with a less favorable impression of the brand. Why did this happen? Because each interaction did not focus on my needs as a customer, instead they focused on their needs as a company. The company wants to get the word out about Advanced TV. Who cares if some people who get the email are unable to buy the product. The company wants my email routed to a specific department. Who cares if that adds time before we satisfy that customer? We, as interaction designers and usability professionals, need to remember that the value the user derives from the experience needs to be paramount. When we forget that, we drive people away from our sites and away from our brand. Cleveland, OH -- November 1, 2008 -- NEOUPA, the local chapter of the global Usability Professionals’ Association, is celebrating World Usability Day Thursday, November 13 from 6-8:30pm at KeyBank’s Tiedeman offices by discussing how professionals in the community are infusing and advocating usability in the companies they work for and the Web work they do. The panel of presenters is from a variety of local organizations, including Ernst & Young, Cleveland Institute of Art, KeyBank, Progressive Insurance, American Greetings, and more. Additional details and registration can be found at www.neoupa.org. World Usability Day was founded in 2005 as an initiative of the Usability Professionals' Association to ensure that services and products important to human life are easier to access and simpler to use. Each year, on the second Thursday of November, over 225 events are organized in over 40 countries around the world to raise awareness for the general public, and to train professionals in the tools and issues central to good usability research, development and practice. "Web users today are task-oriented. They don’t have time to waste and they’re on a mission to get done what they’re trying to do," says Cathleen Zapata, President of NEOUPA, "Usability is the fundamental foundation of creating an outstanding customer experience that meets both customer needs and business goals." The event is FREE but registration is required at www.neoupa.org. Food, networking, knowledge-sharing and the chance to win over $300 in prize giveaways are all part of the event. This year’s platinum sponsor is Brulant, Inc./Rosetta, with additional sponsorship by SMI: Eye & Gaze and Progressive Insurance. The event is being held at KeyBank, 4910 Tiedeman Road, Brooklyn, Ohio. Registration is required at www.neoupa.org. NEOUPA is the official Northeast Ohio chapter of the international Usability Professionals' Association. NEOUPA was started to educate, motivate and promote usability throughout Northeast Ohio for individuals interested in, involved in or responsible for Websites, applications, software or any other type of user interface where usability is a key to success.